In June 2013, Da Nang started to build a pull cable trolley named “Mountain sightseeing Trolley”. The system of hiking train can reach the speed of 5 m/s, moving on 400 meters rail, transportation capacity can be up to 1,600 guests per hour. 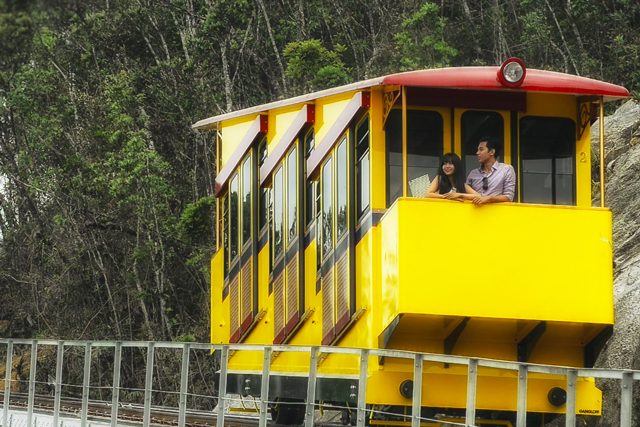 The trolley takes tourists to famous destinations in Ba Na Hill such as Le Jardin flower garden, old villas, etc. And on April 26th 2014, this mountain sightseeing trolley was officially launched in Ba Na Hill in Da Nang city. The trolley helped tourist have chance to enjoy various attractive landscapes and architectures on the hill with an easier and safer and time-consuming way. This is a means of transport designed in the late 15th and early 16th centuries in Austria, which were used to transport people and goods through the rugged mountainous areas surrounding the castle Hohensalzburg. And it was reused in the late of 19st century in urban areas in the West. Visiting Ba Na Hill with this amazing trolley, you will have chance to see all of attractive destinations on the hill without any effort. You don’t have to walk by your feet to discover the imposing and natural beauty of mountains and forests. It is the only “hiking train” in Vietnam.